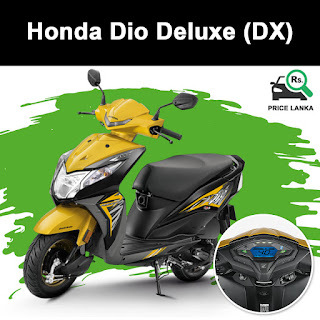 The New Honda Dio DX (Deluxe) Scooter Price in Sri Lanka 2019. Honda Dio DX mileage/ fuel efficiency can be expected to be around 40-50 kmpl. The only difference between Honda Dio DX DLX (Deluxe) and Honda Dio STD (Standard) version is the Dio DX has a digital meter and comes with gold coloured rims. Stafford Motor Company is the authorized distributor for Honda Dio DX / Dio DLX Scooters in Sri Lanka and available in all sales outlets across the country.